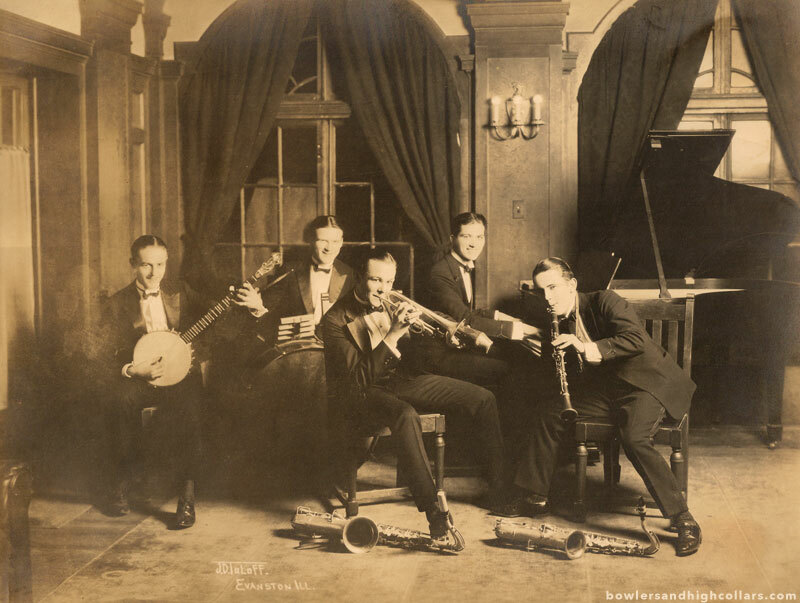 A gorgeous vintage 7″ by 10″ photograph of the Jazz Jesters, a Northern University jazz band founded by Jimmie Caldwell and based in the Chicago of the early 20s. I can’t help but imagine the wild soirees these five slick musicians played for, and how much illegal alcohol they saw flowing. This photograph is attached to a grey album backing with a note stating the organist (Jimmie Caldwell) played at a venue (I can’t decypher) in Omaha. A big thank you to Mavis Purdy of The Vintage Photo Booth group on Facebook and Christian Perales of the Jazz Age group on Facebook too. This entry was posted on Wednesday, May 27th, 2015 at 1:27 pm	and tagged with 1920s, Chicago, Evanston, Illinois, Music, prohibition era, Ragtime, Roaring Twenties, USA and posted in Groups, Others. You can follow any responses to this entry through the RSS 2.0 feed.